A few things have changed since we were in Galt last! Wet and windy test running the CUAR course today. Hopefully the weather is a little nicer on May 5th! First tentative steps on the ice at today's Stars WAR! 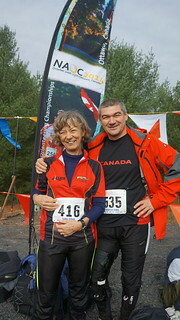 The Stars Orienteering Club is a non-profit organization that organizes training and racing opportunities for adventure sport athletes and anyone interest in exploring the region's natural areas. Our members include orienteers, trail runners, adventure racers, and hikers. We are based in the Waterloo Region of Ontario, Canada, which includes the cities of Cambridge, Kitchener, and Waterloo. We train and race throughout the year. We suggest you attend one of our training sessions or races to get introduced to the sport. The Stars are proud to be partnered with DontGetLost Adventure Running to bring the Adventure Running Kids program to our region. The ARK KW program offers kids from ages 6-14 the opportunity to get muddy, run fast, and learn about navigation.